Is there any program out there to convert MP4 to MPEG? I'm using Windows. I need a little help converting some MP4 movie files to MPEG format to play on my home DVD player for my daughter. Does anyone know of a simple to use mp4 to mpeg converter? I have tons of MP4 videos and want to convert them to MPEG. I have mp4 clips from my Xbox 360 and want to burn them onto disc so I can play on my DVD player which only accepts MPEG-2 format. FFmpeg is a regular free tool for MP4 to MPEG Mac conversion, though it actually removes audio after conversion sometimes. It's time to break stereotype and move to a better MP4 to MPEG converter. 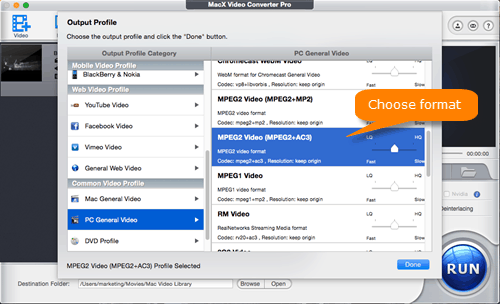 MacX Video Converter Pro is precisely the one that converts MP4 to MPEG, MPEG-1, MPEG-2, MPEG-4, MPG in three steps without any troubles so you can play MP4 on DVD player, etc. Besides, as one of the best video converter for Mac and Windows, it also converts MPG/MPEG to MP4, WebM to AVI, AVI to MP4, YouTube to MP3, MKV to MP4, H.265 to H.264, MP4 to SWF and so on. This program is perfectly compatible with macOS High Sierra, 10.12 Sierra, 10.11 El Capitan, MacOS 10.6 or above, and Windows 10/8/7/XP/Vista. Load MP4 files to the program. 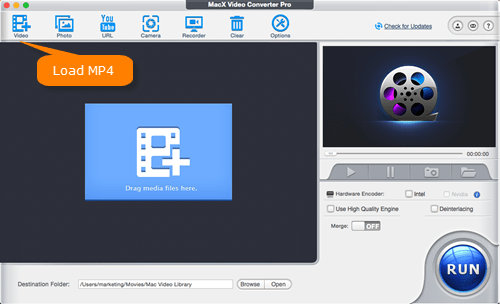 Before everything, you need free download MacX Video Converter Pro on Mac and launch it. Then directly drag & drop MP4 files or tab Add Video to load your MP4 files. For Windows users, try MP4 to MPEG Converter for Windows here! Select MPEG as output format. MPEG is compressed using MPEG-1 or MPEG-2, MPEG-4 compression. So you can choose MPEG-1 or MPEG-2 as output format from the automatically popped up window. Simply go to PC General Video > MPEG2 Video/MPEG1 Video to convert MP4 to MP4G2 or MPEG1. Start the MP4 to MPEG Conversion. Just hit the RUN icon, and the MP4 to MPEG converter will do the rest for you. This will be accomplished within a few minutes, but the original video quality reserved. If you don't want install any programs on your computer, you can try free online video converters 2017 to convert MP4 to MPEG/MPG (MPEG-1, MPEG-2, MPEG-4). This ensures a neat computer after MP4 to MPEG converted. And usually, no more than 4 steps are needed for converting mp4 to mpeg Mac/Windows: 1 - select a local MP4 file or URL you wish to convert. 2 - choose MPEG as output format. 3 - optionally, enter you email to receive converted files. 4 - convert MP4 to MPEG now. But unfortunately, online MP4 to MPEG converters like Convert.Files, Zamzar, Convertio, FileZigZag are also criticized by users for its insecurity, unexpected popups from time to time, and potential malware. So in order to convert MP4 to MPEG safely and efficiently, you'd better download MP4 to MPEG converter at the initial. MP4 is a standard developed by the Moving Picture Experts Group (MPEG); commonly used for sharing video files on the Internet.The MPEG-4 video is compressed with MPEG-4 video encoding. Audio is compressed using AAC compression. MPEG, Popular video format standardized by the Moving Picture Experts Group; compressed using MPEG-1 or MPEG-2 compression; often used for creating movies that are distributed over the Internet. 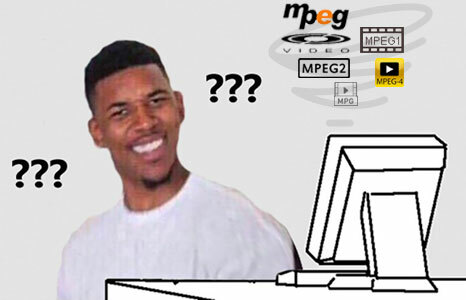 MPEG is a workng group that contains many standards consisting of different parts, including MPEG-1, MPEG-2, MPEG-3, MPEG-4, MPEG-7, MPEG-21. MPEG-1 has standard for VHS video quality, lower quality, but performs better in lower bitrates. While MPEG-2 owns standard for DVD quality, better quality and supports higher resolutions and bitrates. In other words, MPEG-1 is used with video compact discs (VCDs) while the higher-quality MPEG-2 is used for DVDs. MPEG-4's biggest difference from the other MPEG formats is its ability to store subtitles, still images and other data along with digital video and audio. It's usually applied to portable devices and Internet streaming. MPG is a file extension (.mpg) for MPEG-1, MPEG-2 files. 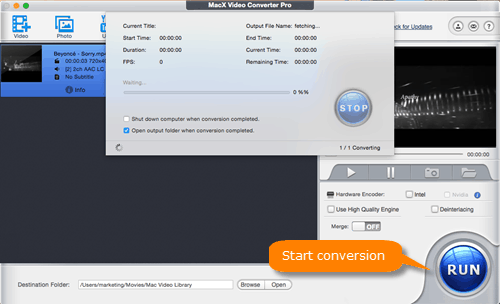 MacX Video Converter Pro is the best MP4 to MPEG converter for macOS and Windows, which can convert MP4 to MPEG with good quality, 5x faster speed than free (online) MP4 to MPEG converter. No size limits, no ads, no plugin, no extra software.